With recent IQVia (formerly IMS Health) statistics revealing 7.2 million 0-17-year-olds — including more than 622,000 aged 0-5 — are taking mind-bending psychiatric drugs in the U.S., the documentary “Letters from Generation Rx” by filmmaker Kevin P. Miller, an award-winning documentary writer and director, is a vital watch and warning, especially to parents. The film premieres Friday, Nov. 9, 2018, at 8 p.m. ET/PT on the Scientology Network’s DOCUMENTARY SHOWCASE. The weekly series provides a platform for independent filmmakers to air films on important social, cultural and environmental issues and will also air at 11 a.m. on Saturday, Nov. 10, and 2 p.m. on Sunday, Nov. 12. Increased psychiatric labeling and drugging of children is now irrefutably linked to the increases in senseless acts of mass violence and suicide impacting our culture. Ten years ago, Miller first created “Generation Rx” to help expose this and how millions of American children are prescribed debilitating psychiatric drugs at the earliest stages of their growth and development. In response to the documentary, thousands of people wrote heart-wrenching stories to Miller, sharing their experiences on psychiatric drugs. 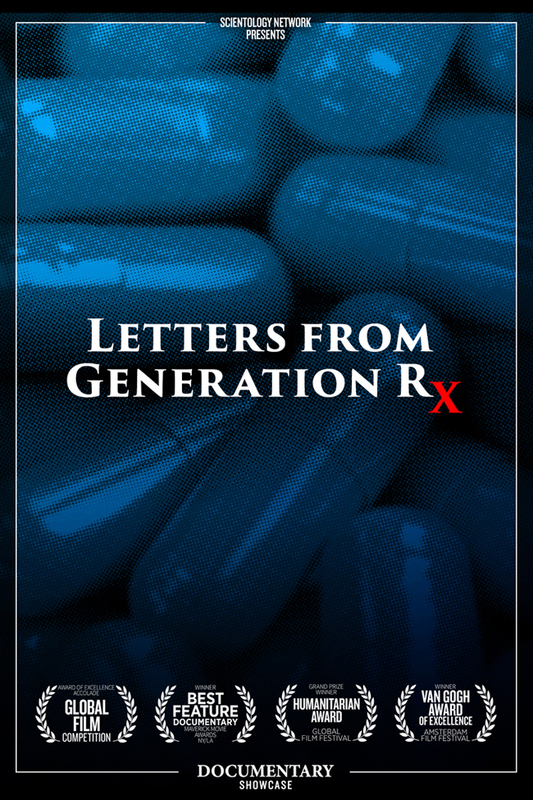 He combined these gripping tales with the latest mental health industry research and interviews with experts to produce the award-winning “Letters from Generation Rx,” narrated by Academy Award winner Tilda Swinton. DOCUMENTARY SHOWCASE debuts films weekly from award-winning independent filmmakers whose goal is to improve society. Says Miller, “I’ve spent a lifetime writing and producing films about the most enduring social challenges of our time: poverty, homelessness, racism and more. When I first discovered the illegitimate use of psychotropic drugs among children and teens in 1992, I assumed that others would consider it a human rights issue — just as I did. But sadly, over the past 25 years, that has not been the case. Politicians, the media and certainly medical doctors have ignored the falsified science used to make many of these drugs legal; they have ignored the abuse of millions of children who have been prescribed these drugs, and most disturbing — they have watched tens of thousands of people die on these drugs without revealing the dark and dangerous side effects often associated with their use. The film provides a first-ever interview with Thomas Insel, MD, former head of the National Institute of Mental Health (NIMH) and officials at the Food and Drug Administration (FDA). The FDA continues to approve psychotropic drugs despite side effects that include weight gain, diabetes, insomnia, mania, psychosis, hallucinations, depersonalization, suicidal ideation, homicide/homicidal ideation heart attack, stroke and sudden death. Miller’s films have won him numerous international Film and Television awards. Though he has carved a unique path as a documentarian through films that deal with medical freedom of choice, he also values his work on behalf of the poor, military veterans, Native Americans and children. His previous projects include working with some of Hollywood’s greatest actors, including James Earl Jones, Dame Judi Dench, David Suchet, and Tilda Swinton. Supporting the documentary premiere is the Citizens Commission on Human Rights, a 50-year-old mental health industry watchdog group which has an online Psychiatric Drug Side Effects database that allows people to research the potential side effects of common psychiatric drugs. The group says “Letters from Generation Rx” is vital to counter an industry that makes $35 billion a year from the sales of these drugs in the U.S. that harm millions.